lol missed nargile walla. Nice pic. The pic and the info are very good, but you forgot to mention the hakawaty(story teller) who sits there on a high chair, dressed up in traditional dress(tarbouch and all), holding a wooden stick and reading from his big story book the adventures of Antar. Looks like a great city to visit, great cafe's, try a argileh, see the sights, more history than I could ever ask for.. Even the story teller sounds grand. You think a bald white guy from california would be welcome? 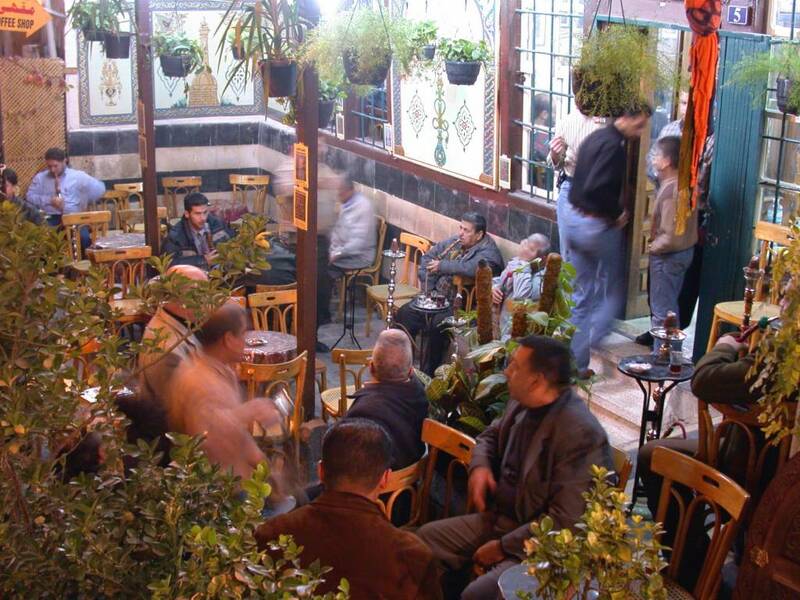 I've heard about the corruption in Syrian business circles, but that doesn't change my opinion: Syria (Damascus in particular) is an country (and city) rich in culture and beauty. Nice post as usual, Ayman. I have shot an external photo for An-Noufarah. It is shown at.. This cafe is fantabulous!! REminds me of a greenhouse. How unique to be having tea, coffee and all the in-betweens in a greenhouse! I love the decor, I really, really do. It's more classier, homely and atmospheric than those contemporary modern day lounges. And i would so love to eavesdrop on the conversations of these men! They speak wonders, I bet ;P Story-teller?? Where??? I cannot see one in the picture. What kinda stories would he tell?? Arab folk tales? thanks for the beautiful work you've done...i've been surfing around for about six hours,i've voted for you, i've also sent the link to my family abroad for i know how much they miss these small details of Damascus & which your work reminds of... .
i wanna say that everyone from all over the world is invited to visit Damascus & enjoy its culture. i hope my city will be "clean" sometime soon so i won't have to leave it & live abroad just like the rest of my family..like the rest of you Syrians running away from corruption kings who are leaving us nothing.. .